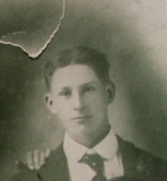 Comments: Terry Everett (Nee: ) | MI USA | 1901-1920 | Comments: This is my grandfather Terry Everett when he was about 17. He was born in 1889 in Ionia County, MI and died in 1943 in Antrim County, MI. I am submitting several other pics all taken from the same photo I cropped this from.